How ignoring your thyroid could be derailing your SIBO recovery…. After spending a lot of time interacting with the SIBO community and through my own experience and research, I think many practitioners and SIBO sufferers fail to recognize the importance of a healthy thyroid during SIBO treatment. The thyroid is a butterfly shaped organ that produces hormones that are used by virtually every cell in the body. These thyroid hormones are in charge of our bodies metabolism; which means they determine how we utilize the calories that we eat. Here is a great site for you to learn some of the basics on the thyroid and also the symptoms of thyroid dysfunction. When looking at thyroid function, it is crucial to understand the types and importance of the hormones involved. TSH is often used as the go to measure for thyroid function, but this is actually a hormone released by the pituitary gland to signal the thyroid to produce T4, the main hormone produced by the gland. T4 is inactive and serves as a storage hormone until it is converted to the active T3 hormone that is able to be used by the body. The conversion from T4 to T3 is essential and can often be disturbed in SIBO patients leading to low T3 and hypothyroid symptoms. In my first post on probiotics, I highlighted that SIBO is usually accompanied by a disturbance in small intestine motility. The thyroid hormones, like the MMC, play a crucial role in the rate at which our intestines process food. So, if you have suboptimal thyroid function, your food will sit in the small intestine and ferment leading to an overgrowth or exacerbation of an existing overgrowth. With this in mind, it is not surprising that there is a strong association between hypothyroidism and SIBO. In fact, one study even found that 54% of the hypothyroid participants tested positive for SIBO when given a glucose breath test. I tend to believe that the small intestine dysfunction due to low thyroid function could be the primary cause of some cases of SIBO. But, it is also important to understand that suboptimal thyroid hormone production can also be a consequence of the inflammation caused by SIBO. A bacterial overgrowth can cause toxic endotoxins from the cell walls of the bacteria like LPS (lipopolysaccharides) to be released from the gut inducing a systemic inflammatory response. A study that administered endotoxins in dogs yielded a significant decrease in T3 and an increase in T4 and reverse T3. This dog study highlights how oxidative stress and inflammation (from the endotoxins) creates an under conversion of the inactive T4 hormone to the active T3 hormone. Low T3 created by the inflammation from SIBO will present with all the classic and miserable symptoms of hypothyroidism like brain fog, fatigue, hair loss and weight gain, but will often be missed by your doctor. True hypothyroidism will present an elevation in TSH, but many people with inflammation induced thyroid dysfunction will not present with an abnormally high TSH. This presentation creates a huge problem, because doctors usually only test a patient for TSH and rarely test for T3 levels. With a normal TSH, doctors often send their patients on their merry way thinking that their thyroid function is healthy when it could be derailing their SIBO recovery. 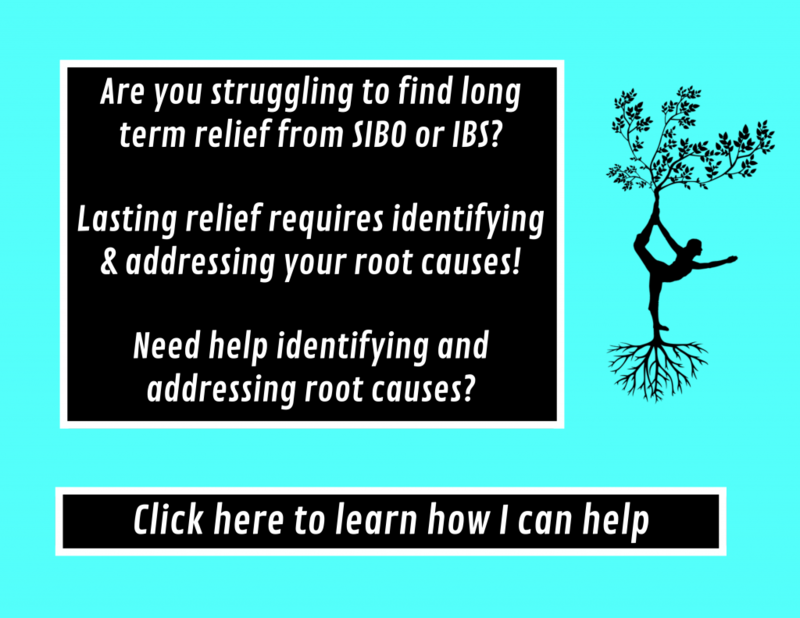 So, when looking at your thyroid function in the context of SIBO treatment it is important to try to determine if inflammation from your SIBO is causing low thyroid output or whether hypothyroidism is at the root of your SIBO. Either way it is absolutely essential to address the thyroid during SIBO treatment! I think that many SIBO diets tend to suppress the thyroid even further; which can lead to an inability to make a full recovery. With the strong association between thyroid dysfunction and SIBO, most people should have a full thyroid panel done before treatment in order to determine the best treatment. Thyroid markers can be achieved through a simple blood draw by a lab and are usually covered by most insurance plans. But, in order to get a full picture of your thyroid health, you are going to want to ask your doctor to test for ALL the important thyroid players and not just TSH (which really doesn’t tell you to much). The thyroid markers you are going to want to test are: TSH, free T3, free T4, reverse T3 and also thyroid antibodies to rule out autoimmune diseases of the thyroid like Hashimoto’s disease. Stopthethyroidmadness.com has a great article on how to interpret thyroid labs. If these labs reveal abnormalities, you will want to work with a functional medicine practitioner to help you determine the best way to address your SIBO, while also supporting your thyroid. For instance, people with low thyroid function or Hashimoto’s disease (an autoimmune disease attack on the thyroid) often worsen on very low carb diets that are universally prescribed by many SIBO practitioners. Also, some people may need to support better thyroid function during SIBO treatment with supplements and bio-identical hormones. Low carb diets may be therapeutic for some at the beginning, but staying on them for longer than a month or two can suppress your thyroid function and as a result your gut function. The main role that carbs play in thyroid function is through their insulin response. When we eat carbs, our body releases insulin; which allows our cells to take in glucose from our blood stream. Insulin is necessary for the conversion of inactive T4 to active T3. Someone who eats a low carb diet is going to have low insulin levels which could result in low T3 levels and hypothyroid symptoms. I remember when I was in the midst of my SIBO struggles being terrified of eating too many carbs. I was probably eating like 50g a day (sometimes lower) and feeling like a complete zombie. I had no energy, my gut symptoms seemed to worsen and I felt emotionally out of control. After months of eating low carb, my body seemed to be screaming out for more carbs, but the anti-carb attitudes from many SIBO experts seemed to drown out my cravings. I remember bringing up my cravings to my practitioner at the time (we have since parted ways) and he would warn me not to give in saying that the bacteria themselves were trying to coax me into eating forbidden carbs. Although, there is growing evidence that microbes effect our cravings for foods, that does not mean that every craving is inherently our gut bacteria’s attempt at sabotaging our recovery. Actually, cravings can also be powerful signals from our body that we have a nutritional deficiency. Once I overcame my carbophobia and started gradually adding more whole food carbs into my diet again, my energy and gastrointestinal symptoms began to improve. I think the big takeaway from my story is that you should listen to your body to determine what carb intake is right for you and not arbitrary guidelines that are prevalent in the SIBO sphere. If you started eating low carb and are experiencing signs of thyroid dysfunction, then you probably need to up your carbs. So, how many carbs do you need to eat? I think different people are going to have different carb needs and I think a low carb approach in the beginning of treatment can be helpful in reducing the bacterial load in the small intestine. However, prolonged low carb diets can really exacerbate any existing thyroid problems and can even create new thyroid problems. It can be a tricky balance trying to eat enough carbs for good thyroid function without exacerbating SIBO symptoms, but through proper self-experimentation you can usually find that sweet spot. As a starting point, I think we can look at what is recommended for each of these conditions. This table from Chriss Kresser’s book Your Personal Paleo Code provides suggested carbohydrate intakes for various health conditions with a recommendation for women with gut disorders to eat between 50-75g of carbs a day, but also says that women with hypothyroidism should be eating between 75-150g of carbs a day. In his book, he also says that non-starchy veggies should not be included in the daily carb allotment above. So, the bell peppers, cucumbers, green beans and broccoli should not be included in your carb calculations. I think when dealing with the complications of trying to find the optimal carb intake a good approach would be to start at the upper end of the recommendation of the gut recommendation and the lower end of the thyroid recommendation disorders and adjust from there. So, I think 75g is a good starting point. If you are still having hypothyroid symptoms at that intake than you may want to up the carbs. You can also play around with the types of carbohydrates you are eating to see which ones you tolerate best. Finding the right carbs for your body can help you increase your carbohydrate load without increasing your SIBO symptoms. A food journal may be helpful during carb experimentation. Personally, when I first started upping my carbs I usually ate between like 75g to 100g of carbs a day, but now that my SIBO is under control I find that I feel best closer to 150-200g of carbs a day. You can click on these to links to see the average grams of carbs in fruits and safe starches. Another issue is that SIBO diets are extremely restrictive, which I think makes it extremely easy for people to under eat. Chronic undereating can also cause conversion issues leading to low T3 levels. Also, the added stress of a restrictive and lower carb diet can cause a rise in cortisol that will result in low T3 and high reverse T3 levels. Iodine is a mineral that is essential for the production of thyroid hormones in the body. T4 contains 4 iodine molecules while T3 contains 3 iodine molecules. Most Americans don’t eat enough iodine in their diet, but people with SIBO seem to unintentionally lower their intake when they start a restrictive diet. Many iodine rich foods like eggs, iodized salt, potatoes and dairy are eliminated during SIBO treatment, which leaves people on SIBO diets at risk of developing iodine deficiencies. To exacerbate the problem further, many real food SIBO dieters increase their intake of goitrogens, which are compounds in certain foods that inhibit iodine uptake by the thyroid gland. Goitrogenic foods are very nutritious and healthy (broccoli, kale, spinach, strawberries, peaches, apples and many more) if adequate iodine is present in the diet. Fermentation seems to amplify the goitrogens effects of the substrate, so popular gut friendly foods like sauerkraut and kimchi could cause problems if eaten in large amounts without consuming iodine. Iodine is not only essential for thyroid health, but it is necessary for proper immune function. The bacteria killing white blood cells, Neutrophils, need iodine in order to effectively destroy the bad bacteria in our body. Neutrophils usually draw their iodine from thyroid hormones. During times of infection, thyroid hormones will concentrate in infected areas of the body where it is consumed very quickly in order to support neutrophil’s iodine needs. In the book, The Perfect Health Diet by Paul Jaminet and Shou-Ching Jaminet describe that “a deficiency in thyroid hormone impairs immune defenses by depriving neutrophils of iodide. An ordinarily adequate intake of iodine can lead to hypothyroidism during chronic infections, if thyroid hormone is consumed by immune cells faster than it can be replenished from a limited iodine pool.” With this in mind, I think you could argue that individuals with SIBO may need higher doses of iodine in order to provide iodine to the neutrophils while also maintaining a healthy level of thyroid hormones. So, what is the right dose of iodine? This question becomes very complicated and often requires working with a skilled practitioner who can analyze your individual needs for iodine. But, I think a good first step if you are experiencing thyroid dysfunction is to test your iodine levels to determine if a deficiency is present. An iodine loading test is, in my opinion, the most accurate way to determine whether you have an iodine deficiency. For more information about this testing, you can follow this link to the lab that I used for my iodine testing. Iodine supplementation is a hotly debated and polarizing topic in the integrative medicine community. The RDA is 150 mcg, but some practitioners recommend 50mg doses for therapeutic purposes. That is 50,000mcg! The RDA was based on the minimal amount of iodine to prevent goiter and I don’t believe it is the proper amount to optimize health especially considering our current exposure to iodine blockers like the fluoride in our water and bromine in our processed foods. But, 50 mg is very high and should only be considered if a severe iodine deficiency is present and if you are being treated under the supervision of an iodine savvy doctor. Chris Masterjohn and Chris Kresser seemed to agree in their podcast discussion that determining the right dose should be highly individualized. Iodine status. If discover that you have an iodine deficiency, higher doses of iodine may be necessary in order to refill your tank. Many iodine using practitioners recommend high doses between 12.5-50mg doses. According to Dr. Brownstein, a prominent iodine researcher, it usually takes 3 months of supplementing 50 mg of iodine to correct an iodine deficiency or a year with a 12.5mg dose. Although, there are plenty of people who have had great results at these doses, there are also plenty of people that don’t! I would use some caution if you plan on supplementing higher than 1 mg. You should always work up slowly to allow your body time to adjust to the increased levels of iodine. Paul Jaminet recommends starting at 225 mcg and doubling the dose every month until you reach your desired iodine intake. He warns, “A too rapid increase in iodine may lead to a transient hyperthyroidism often followed by reactive hypothyroidism. However, if doses are altered gradually, normal human thyroids can adapt to excess intake of iodine by autoregulation.” Slow and steady seems to be the way to go. If you get tested and you are not iodine deficient, then Paul recommends eating iodine rich foods like eggs and sea food or supplementing with 225 mcg a day. Bromide and Fluoride Toxicity. Some people have high levels of these toxic halogens that can interfere with iodine’s utilization in the body causing thyroid dysfunction (among other problems). Iodine displaces these toxic halogens allowing them to be excreted from the body. When I took my iodine loading test, I also had the lab look at my fluoride and bromide levels and was shocked to see neurotoxic levels of fluoride excreted. Iodine is one of the most effective way to remove these thyroid disruptors from the body. With continued supplementation, I am hoping to see my fluoride levels drop. Hashimoto’s disease. If you have autoimmune hypothyroidism, then iodine supplementation can be like throwing fuel on the fire and can exacerbate the condition. Although, iodine advocates say that iodine supplements will usually only exacerbate Hashimoto’s if a selenium deficiency is present. Mike Mutzel wrote a great article describing the importance of a selenium iodine balance and explains how iodine supplementation in a state of selenium deficiency triggers autoimmune problems. But, the good news is that research shows that supplementing with selenium in conjunction with iodine will protect against auto-immune attack. I would work closely with a doctor if you plan on trying iodine and have Hashimoto’s, because it can be risky. Iodine supplementation may not be the best course of treatment for some Hashimoto’s patients and should definitely be approached with extra caution when considered. Amount of goitrogenic foods. If you are eating lots of fermented foods, cruciferous vegetables or other goitrogens, you may want to take a higher dose of iodine. Chris Masterjohn mentioned 1 mg of iodine is usually enough to balance out an increased goitrogenic load, but also mentioned that some people with other issues like halogen toxicity or iodine deficiencies are going to need more than 1 mg. For an in depth look at goitrogens, check out this post that Chris Masterjohn wrote for the Weston A. Price Foundation. Iodine supplementation is generally safe if you start slow, make sure you are getting enough selenium and if you don’t have Hashimoto’s. But, there are certainly risks at higher doses. I think if you plan on trying iodine in higher doses (>1mg) you should work with a practitioner to help you determine the right dose. Thyroid dysfunction can be both the cause and a consequence of SIBO. Good thyroid function is important to small bowel function and motility. Long term low carb diets can suppress thyroid function leading to hypothyroid symptoms including delayed motility. Adequate iodine intake is crucial for both thyroid and immune function. Testing your thyroid hormone levels and your iodine status can help you determine the best course of treatment. Previous Previous post: Probiotics….Friend or Foe? Thanks Jason! I have another one that I am wrapping up that I am hoping to post in the next week or so…it is a bit more controversial than my first two, so it will be interesting to see how people respond to it 🙂 Thanks for reading! Great Article…thanks for such great insight…your articles are terrific.